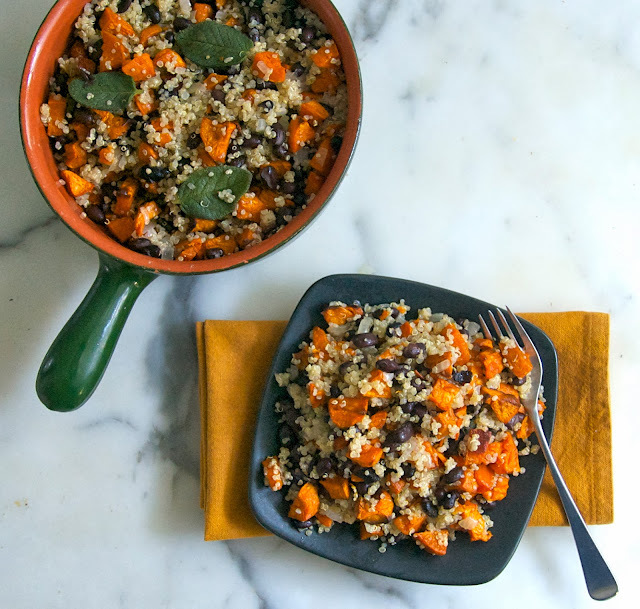 I also refer to this delicious sweet potato black bean quinoa pilaf as Halloween pilaf. 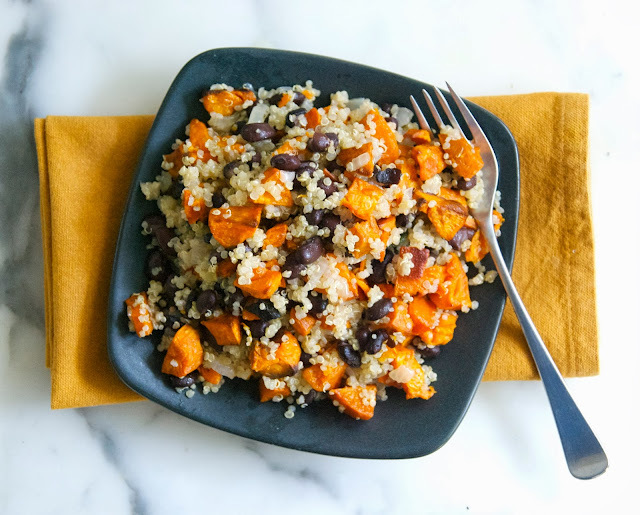 The bright orange of the sweet potatoes mixed with the black beans and seasoned with sage "butter" make it the perfect Halloween dinner. I was at my daughters last week when I invented this recipe. I wanted to make a "seasonal" dinner and I used what she had on hand, but I can imagine a number of variations. For instance, I used quinoa but you could easily substitute rice or even bulgar (cracked wheat) and it would be just as delicious. I flavored the dish with sage "butter". I use a non dairy butter called Earth Balance that doesn't "brown" the way real butter does, but if you substitute real butter, you could brown it with the sage and it would be delicious. 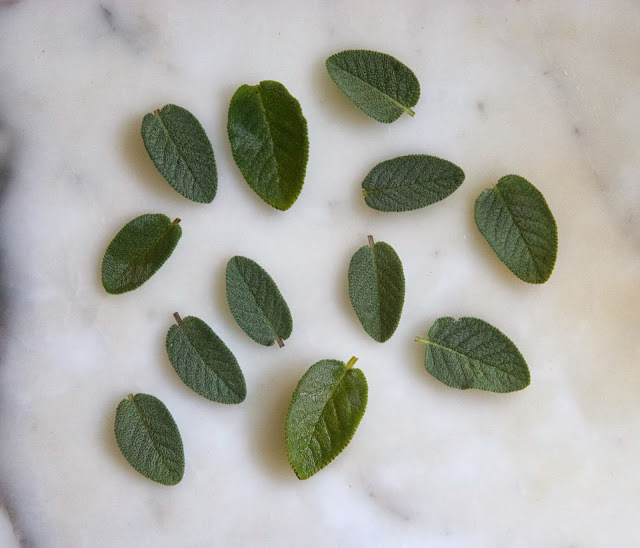 You definitely want to use fresh sage leaves for this recipe, don't substitute dried sage if you can help it. Sage is very easy to grow, a small pot on your kitchen window sill will work just fine. 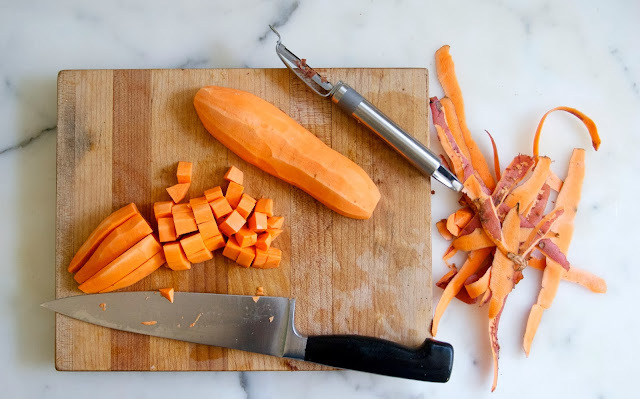 I peeled and cut the sweet potatoes in to small pieces about the size of a black bean or a little larger. Then, I tossed the pieces in a little olive oil and roasted them in a hot oven until they were nicely browned. They're very tasty that way, and they hold up better in the pilaf. The combination of grains and beans do make a complete protein, so I like to eat this as a one pot meal but it can also be a side dish. Don't be afraid to make this pilaf earlier in the day if you want, if you're going to be busy dressing little goblins for "Trick or Treating" and reheat right before serving. It holds up well. Cook for 20 minutes and set aside.